Here’s what’s up in the world of TV for Thursday, March 14, 2013. All times are Eastern. 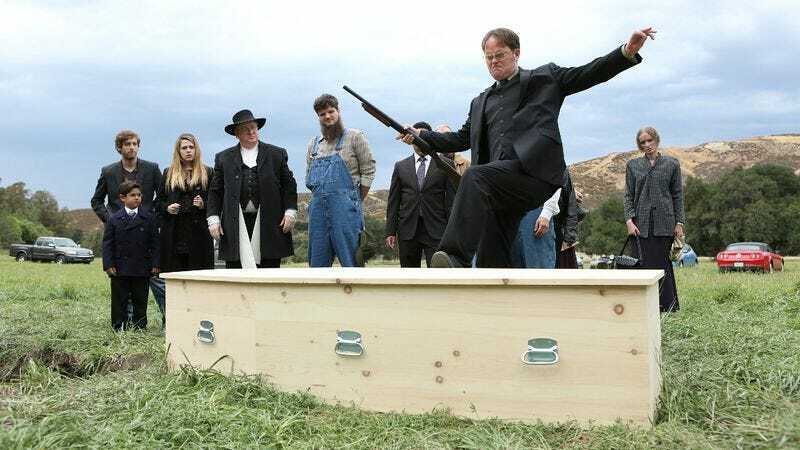 The Office (NBC, 9 p.m.): Rather than discerning—like a person who’s paid to watch TV—that The Office’s recent trips to Schrute Farms were building up to The Farm’s backdoor pilot, Erik Adams just read every previous mention of “Dwight” and “family” and immediately called out “IT’S THE FARM!” Now branded The Boy Who Cried Rejected Pilot, he hopes you believe him when he tells you tonight’s episode is titled “The Farm”—and that it portrays life at the Schrutes’ B&B&B. That’s “bed and breakfast and beet farm,” and this is definitely The Farm. The Big Bang Theory (CBS, 8 p.m.): Howard discovers a letter from his absentee father, and it stirs up all kinds of complicated emotions. Just wait ’til you see the look on his face when he discovers it’s a prank letter written by Oliver Sava! The Vampire Diaries (The CW, 8 p.m.): This show’s been off since Second Opinions Week (Remember that? Good times)—which makes sense, considering the Major Turn its last episode took. But now Elena’s back at school and joining the cheerleading squad, so Carrie Raisler assumes that everything’s peachy keen and the show will soon change its title to The Totally Normal Teen Girl With No Supernatural Connections Diaries. Community (NBC, 8 p.m.): With Advanced Documentary Filmmaking, Community completes a trilogy—though for Abed, it’s a quadrilogy, provided you count “Six Candles” from “Introduction To Film.” As such, Todd VanDerWerff is hoping for more of a Return Of A Jedi situation, and less of an Alien Resurrection. Parks And Recreation (NBC, 8:30 p.m.): Leslie Knope’s latest cause is the humble neighborhood video store, a dying breed that needs all the unfettered enthusiasm and promises of help a Leslie Knope can provide. And when she’s done with that, maybe she can give a boost to Steve Heisler’s favorite hot dog stand. Person Of Interest (CBS, 9 p.m.): Donald Trump* personally guarantees that this Person Of Interest trip to Atlantic City will be the classiest, most glamorous episode of a CBS procedural ever. Glee (Fox, 9 p.m.): Thus began the great Hudson-Schuester feud, a battle over control of the glee club fought not with weapons, but with singing-while-drumming, this horrifying face, and gift cards to Breadstix, probably. It’s a conflict that pits brother against brother, Brandon Nowalk against Brandon Nowalk. Elementary (CBS, 10 p.m.): Jane stars in a very special one-woman investigation, Watson: All On Her Own. But there’s a mystery within that mystery, keeping Sherlock occupied and setting Myles McNutt’s head spinning. Archer (FX, 10 p.m.): Todd VanDerWerff’s “These characters are immortal” theory is put to the test when Archer and Lana attempt to halt a uranium sale. Though it certainly would be an excellent payoff to all those “giant hand” jokes if Lana was irradiated and turned into some kind of She-Hulk. Legit (FX, 10:30 p.m.): This show hasn’t really made good on the promise of its pilot—and the readership just isn’t there—so we’re cutting it loose after Steve Heisler spends one last crazy night with Jim Jefferies. Star Trek: Deep Space Nine (11 a.m.): The Trek-actors-turned-directors trend continues with episodes helmed by René Auberjnois and Avery Brooks. Zack Handlen just wants to know if Auberjnois’ hour, “The Quickening,” has anything to do with the Highlander franchise. Gilmore Girls (1 p.m.): In a weird coincidence, the director of one half of today’s Gilmore doubleheader is Leonard Nimoy’s son, Adam Nimoy. David Sims thought he detected a calm, collected logic in the way Rory’s adventures on the golf course are portrayed. Auction Kings (Discovery, 9 p.m.): A desk potentially owned by Thomas Jefferson is up for sale. Why didn’t show just have Jefferson ride his horse down from heaven to authenticate the object? Funeral Boss (Discovery Fit & Health, 10 p.m.): Is the Cake Boss finally taking advantage of his gift of the second sight in order to stage elaborate funerals? Nope, but Funeral Boss is taking advantage of cable’s newfound obsession with memorial and burial services. Harry Potter And The Deathly Hallows Part 2 (HBO, 8 p.m.): If you haven’t seen any of the previous Harry Potter movies—or read the books that inspired them—you might want to skip out on this broadcast of the franchise’s final chapter. Or you can just join the rest of the world in marveling at the terrible old-age makeup featured in the film’s epilogue. Ghost Dog: The Way Of The Samurai (Sundance, 8 p.m.): Jim Jarmusch and Forrest Whitaker, together as nature intended, paying tribute to French cinema and setting a singular gangster/samurai hybrid to the only appropriate soundtrack for such a combination: a musical score by the RZA. NBA Basketball: Mavericks at Spurs (TNT, 8 p.m.): With Austin hogging all the attention this week, Dallas and San Antonio conspire to steal some of the spotlight back by pitting the Mavs and Spurs against one another 90 minutes south of SXSW.